I'm now published in Computing & Law magazine. 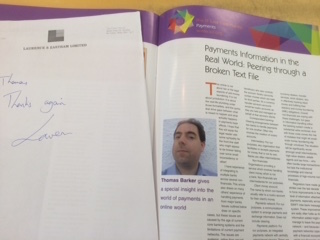 My article is Payments Information in the Real World: Peering through a Broken Text File - essentially a long whine about the state of global wire transfer networks. There are many start-up financing platforms styling themselves as "social lending", "p2p lending" and so on. Always centred around an online loans exchange, some sort of specialised money transfer system, and, a perfectly accurate, emphasis on the "real people" on the other side of the loan. I've had a ring-side seat to some of this, and don't get me wrong it is on the most significant things happening in finance today, but I think some of the Facebook+Credit=Profit cheer-leading is muddled. P2P lending is not an asset class. It is a continuation of the way computer networks have been shifting bottlenecks in finance for over 30 years. Read more about Why so many P2P lending platforms? Why now? Hearsay is a protocol for peer-to-peer social networking over the XMPP chat protocol. I wrote this back in 2004, so it pre-dates Facebook coming to the UK! The specs start from page 57. This is the second of two parts. The first one is here. As before this post is more of an attempt to fit a narrative to my research notes than a clear vision of the future. Read the links!